Nova was not at all what I expected. As I started reading it was more like a YA book with a 16 year old main character. 2/3 of the way through it took an unexpected twist. That twist made Lia’s mission something entirely different. Then there was a discovery that seemed to lead to a much different ending. I was surprised. Even though the entire book had been leading up to it I did not expect it to end as it did. What I liked was that unexpected twist that made this an entirely different story from what it seemed at the beginning. I did find the story a little slow at the beginning. Lia spends a lot of time trying to remember who and what she is. While it was part of the build up to the twist it really was not as much of a mystery to me, the reader, as it was to Lia. There were two very interesting secondary characters who were important to the story and Lia. Michael and his sister Teal are the two Lia interacts with the most and in the end the two who help her complete her mission. Nova is a good addition to the Science Fiction world. Pick it up and see if you are as surprised as I was to see why Lia was a human bomb. 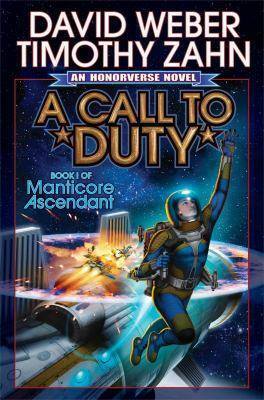 Nova is book one in a new series. It will be interesting to see where the story goes from here. Lia and her mission are just the beginning. I will be looking for the next book in the series to see what happens next. 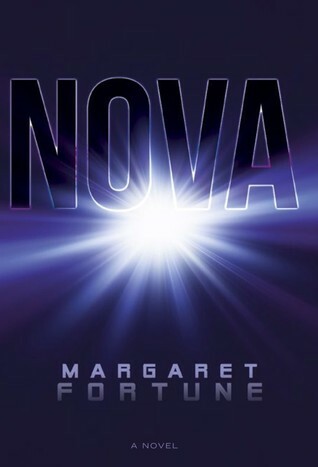 Daw published Nova by Margaret Fortune in 2015. A short list this month as I spend a big part of it traveling. 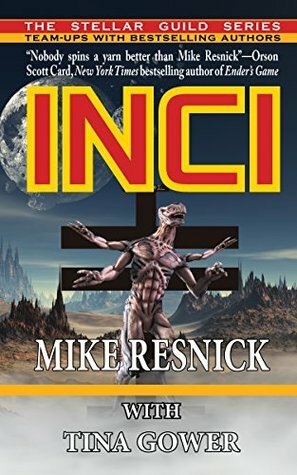 INCI by Mike Resnick and Tina Gower - This is actually three stories and Resnick’s is the last one. The two by Tina Gower set the background. Resnick’s starts as a search and ends on an unusual note. Don’t look for a happy ending. It just is not there. Interesting to read but not one of my favorites. However, all three are very well written. This is one I looked at when attending World Con but did not buy. 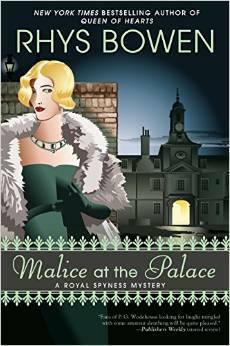 I picked it up when it appeared on Netgalley. A Cowboy Under the Mistletoe by Vicki Lewis Thompson – Thunder Mountain Ranch has another boy come back and find love. Ty Slater has part of his past walled off. Whitney Yates knows that for the two of them to have a life he must tear down that wall. Another nice story in the Thunder Mountain Ranch series. Look for a new character to return to Thunder Mountain. Will he find love? 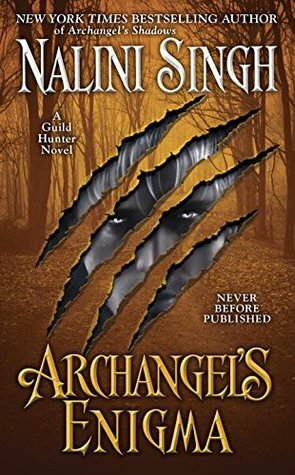 Archangel’s Enigma, A Guild Hunter Novel by Nalini Singh – A nice love story with two very good characters. I loved Nassir, a vampire who was not a vampire. Andromeda was a perfect match. Their story was filled with adventure, tension and danger. There are scenes with other characters from the series. The ones with Raphael and Elena set the stage for future books. "We must have charge in both the external world, your focal character's state of affairs, and his internal world, his state of mind. Neither can stand without the other. Only as they interact, meshing like finely tooled gears will you story roll forward." Techniques of the Selling Writer by Dwight V. Swain - I used this in my Musing Mondays post and decided to share a quote from the book as a tease. I have several about types of books and how to write a book. 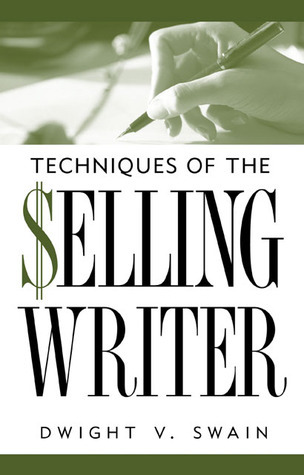 I think Techniques of the Selling Writer by Dwight V. Swain is the one I enjoyed the most. I often get the urge to try to write a book but then I see something I want to read and writing just goes down the tube. 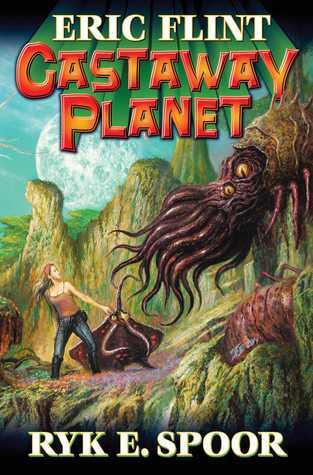 Humans expanded into space…only to find a universe populated with multiple alien species bent on their destruction. Thus was the Colonial Union formed, to help protect us from a hostile universe. The Colonial Union used the Earth and its excess population for colonists and soldiers. It was a good arrangement...for the Colonial Union. Then the Earth said: no more. 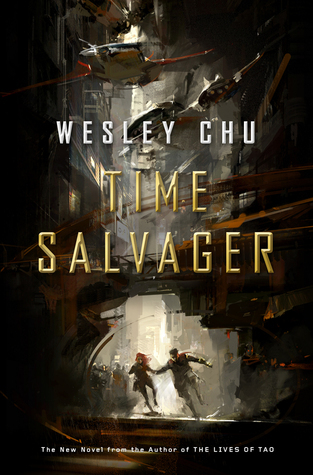 In this collapsing universe, CDF Lieutenant Harry Wilson and the Colonial Union diplomats he works with race against the clock to discover who is behind attacks on the Union and on alien races, to seek peace with a suspicious, angry Earth, and keep humanity’s union intact...or else risk oblivion, and extinction—and the end of all things. 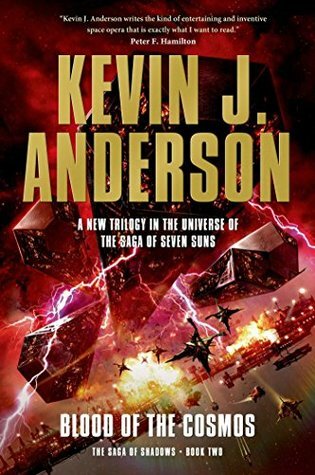 Set in The Old Man’s War universe The End of all Things once again follows CDF Lieutenant Harry Wilson as the Colonial Union, Earth and the Conclave face new dangers. A set of four novellas make up the book. While Wilson is a character in all different people are featured in each. I love The Life of the Mind. Who knew a brain in a box could have so much personality. This Hollow Union is set in the Conclave and features several of the aliens. The politics don’t sound too different from what we hear today. I found the habits of some of the aliens very interesting. Can Long Endure follow several CDF soldiers as they try to put out fires. Things are not going that well. The final reaction by one of the characters says a lot about what the future holds for the Colonial Union. Finally To Stand or Fall brings it all together. All three governments have to decide how the future will play out. That is the end of all things. At least for now. 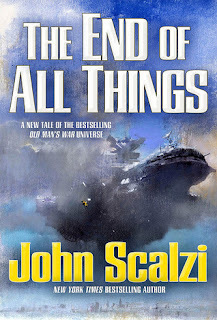 Scalzi does not say that he will never return to this universe so we will see. 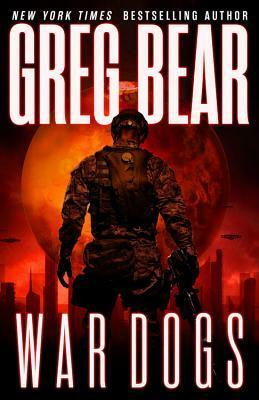 This is a nice addition to the Old Man’s War Universe. To understand the world building and back story you really need to have read the previous books in the series. If you have this is an enjoyable story and one you might not want to miss. 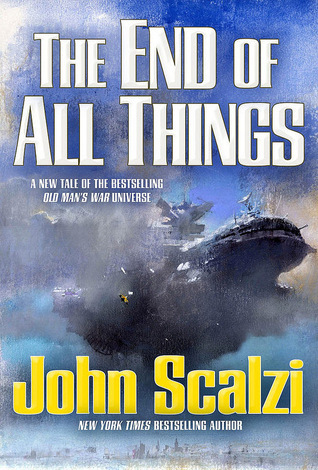 Tor published The End of all Things by John Scalzi in 2015. "So, I'm supposed to tell you how I became a brain in a box." "That answered the question of who these people were. But it didn't answer the question of why me." From The End of All Things by John Scalizi. Fool’s Gold is just full of romance as Madeline Krug, a long standing character in the series, and Jonny Blaze, a newcomer, find out. Madeline is just an ordinary working woman and Jonny is a movie star looking for a normal life. When they are thrown together magic happens. This is another nice sweet love story from Mallery. It is full of the expected elements in a Fool’s Gold story however is one slightly different twist at the end. 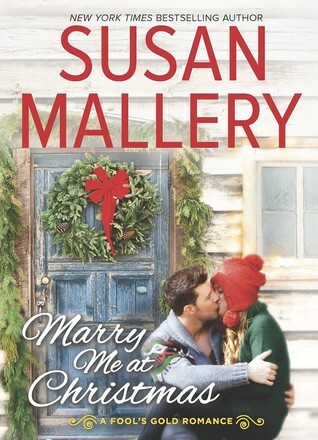 Harlequin published Marry Me at Christmas by Susan Mallery in 2015. I received an ARC of Marry Me at Christmas from Netgalley in return for an honest review. Another winner for Dare. This is full of the humor Dare is famous for. I found more than a few laugh out loud moments along with a great story line. Dare takes several familiar tropes and combines them in a great story full of fun, tension, and romance. Both Maddy and Logan are great characters. They have to be to carry the story line like they do. There are secondary characters but they have a very small part to play. 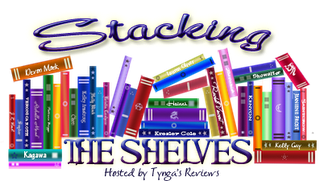 This is part of Castles Ever After series but all of the books work well as stand-alones. Start with any book. Each is a must read for anyone who loves historical romances that combine humor with a great plot. Avon books published When a Scot Ties the Knot by Tessa Dare in 2015. I have been gone for a month and during that time did not do any posts. I had a great time but it is good to be home again. The random question is about rainy days. Yes they do inspire me to get a good book and settle down to read. Of course sunny days also inspire me to read. I also like to read at night. I think I just like to read! This on has been on my wish list for quite awhile so when it appeared on Netgalley I quickly put in a request. It sounded like a fun book and it is. Be warned though. It does contain a lot of foul language and physical violence. It did not turn me off. The violence was a character trait of the difference shifters and the language matched the situation. Both Bear (Lou Crushek) and Girl (Marcella Malone) are interesting characters who are opposites in many ways. It turns out that makes the perfect for each other. Of course that does not become apparent at once. It takes the interference of her family and a very dangerous situtation to finally bring them together. This is part of the Pride series and is book 7. It does stand along but I often knew I was missing the background on some of the secondary characters. I think it would have enjoyed parts of the book more if I had know that background. Brava published Bear Meets Girl by Shelly Laurenston in 2012. I received an ARC of Bear Meets Girls from Netgalley in return for an honest review. I read a lot on my trip but did not do any reviews. I decided to do short and sweet reviews on all the Netgalley book I read for review. Here is the list. No links, no covers just short reviews posted here and on Goodreads. The Brigadier’s Runaway Bride by Erica Ridley – It seems that a return from the dead does not mean a happily ever after for Edmund and Sarah. There is till love on both sides so there is a HEA. Getting Wilde by Jenn Stark – Just did not see the point of this one. It was all backstory and world building and then it was just like the author got tired of writing and just quit. Good Earl Gone Bad by Manda Collins – Easy to read with a familiar story line. Another won at cards romance but with a twist. Well done with some interesting twists. The Colton Bodyguard by Carla Cassidy – A good addition to the series. Each author does a great job keeping everything on track. Primal Force by D.D. Ayres – Book three in the K-9 Rescue series this is another great story with two wounded people who connect because of a service dog. Good addition to the series. Christmas in Mustang Creek by Linda Lael Miller – A new character with a good story line. 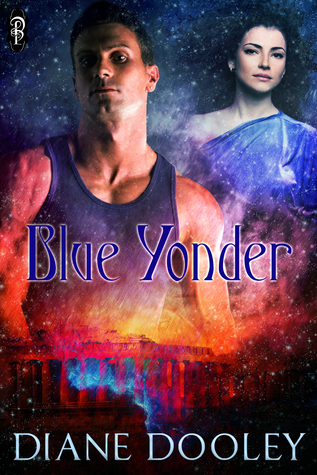 Another fun romance for Miller fans. Look for Mrs. Llozz and see who you think she is. Evergreen Springs by RaeAnne Thayne – New addition to this series. The story is a great fit and the characters are interesting. I liked Thayne’s previous series and this one is shaping up to be just as good. The Last Chance Christmas Ball by Mary Jo Putney, Jo Beverley, Joanna Bourne, Particia Rice, Nicola Cormick – Each author did a very good job with each short story. Each had good characters. Each was a short story and there were no wasted words in any. Great for when you want a quick satisfying read. 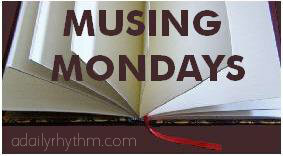 A Curious Beginning by Deanna Raybourn – Raybourn has another winner. I was kept guessing the entire book. The clues were there. Everything from the plot to the back-story added to the mystery. Heirs of Empire by Evan Currie – Currie writes exciting stories and Heirs of Empire is a good example. There is danger, tension, and betrayal mixed with an interesting plot and great characters. 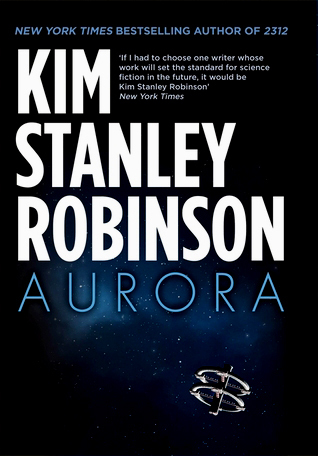 It has a lot of interesting concepts that make it Sci-Fi but not Space Opera. Wish Bound by J. C. Nelson – Book three in the series. I found that I was a little lost as I had not read book 2. Even so a good story that continues to keep the world building and back story going while moving the series forward. Protecting the Colton Bride by Elle James – Those Colton just keep finding trouble while falling love. Very nice series where each story is written by different authors and everything still holds together. Inherit the Stars by Tessa Elwood – Great story. Every action has an reaction and that is the basis of Inherit the Stars. Asa is the main character and I loved the fact that her actions were always about others. This is character driven with twists and turns in every chapter. Fool's Quest by Robin Hobb – This was a Did Not Finish. I just could not get into the story this time.